PBS's Nightly Business Report aired a segment on nanotechnology featuring the Maryland Center for Integrated Nano Science and Engineering (M-CINSE) on Nov. 23. 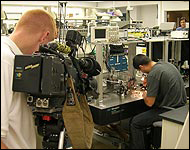 Footage for the segment was filmed during a visit to campus in August, and features a tour of Associate Professor Reza Ghodssi 's (ECE/ ISR) MEMS Sensors and Actuators Lab. M-CINSE's director, Professor Gary W. Rubloff (MSE/ISR) is featured in the transcript of the segment, titled "The Science and Business of Nanotechnology." It can be found on the Nightly Business Report web site. Thanks to Ted Knight of the Electrical and Computer Engineering Department for this report. Ted has available photos from the TV crew's visit to campus on the ECE web site.